I don't think I ever saw this myself, but Don Boettner confirms that in the early days of MTS, if you tried to use the $DESTROY command with a device rather than a file name, you'd get the message "IBM frowns on the willful destruction of hardware". For a time at least the MTS Editor had a "jjj" command that when entered would respond with "Take a break". According to Andy Goodrich who added the command, "jjj was Jill Janice Jackson, who when Clark Lubbers would get riled up would always say 'Clark, take a break' ". And before the justify command was implemented in the MTS editor, entering the command would give the response "No way Tolkin". Again according to Andy, this "was a play off of Don Boettner's place holder for commands, which was 'Not yet, Rosen, not yet', because Bob Rosen was always asking him for new commands. Steve [Tolkin, a member of the UM Computing Center staff] bugged me for the justify command, so I put in the initial response for it before the code was there, but only for Steve's userID." For Scott Gerstenber's userID (WSG.) when lines were deleted from a file, the editor would display "1 line is pushing up daisies" or "<n> lines are pining for the fjords" rather than the usual boring messages that the editor displayed for everyone else. Grelber started out as a program. It think it came from UBC. Later it was added as an option on the $DISPLAY command. 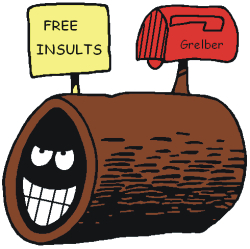 Grelber is the insulting inhabitant of a log in the enchanted forest in the Broom-Hilda comic strip and on TV. Some examples of GRELBER and JOKE output are included below. Only $DISPLAY GRELBER and $DISPLAY JOKE are still present in MTS, c. 1996. Although if I remember correctly, a few of the jokes had to be edited or removed because they were considered to be in poor taste. In the stories that follow Ralph and Jon are from UBC, Gavin is from UM by way of Durham. Subject: Re: GODZILLA is invincible and cannot be destroyed? As I recall, $Disp Joke started as a joke. I was rewriting Msgcc and added a @joke operator as a joke for GREadie. Somewhere I had found a file of jokes which I saved for the future. Since @joke was a joke, it didn't stay in Msgcc. Gone but not forgotten as it reappeared a few years later in the Display command. Grelber came about from a little fun program written by JNightingale to randomly put phrases into a sentence. ARunnals spent a bit of time to generate the vocabulary and thusly we had The Grelber who was willing to insult anyone at the touch of an "enter key". MHayward, who wrote FullScreenMessage ($FSM), was a bit "upset" at the thought of the computer insults, so he generated a Nice vocabulary. "My but you are a most wonderful person in the whole universe". Later I heard they were ordered to be removed by a UBC manager as they were "unprofessional". Was it the aforementioned JNightingale who went on vacation leaving Grelber to 'send back' daily trip reports ? He left and the messages started to show up; Spent the night in scary motel in St Helena but I did have an excellent moose sausage salad in a corner store/gun shop. Then the messages started to get weird as if he was aimlessly lost in America, bouncing from coast to coast or border to border. Then, I think, *Autostart conked out or Jon came home. I think he then sold his program to the government & they still use it to generate press releases. He became a bus driver so he could tell people where to get off. Waiter! Waiter! Do you have frog's legs? No, it's my underwear that makes me walk this way. he answered, "It doesn't matter - I have my car outside." long walk on a short pier you distressingly insignificant lunatic!!! from this location you unbearably retarded ignoramus!!! yourself from this location you amazingly offensive freak!!! What dreadful and moronic drivel have you perpetrated now?? The JOKE and GRELBER example output above was produced on MTS by Gavin Eadie on 7 November 2010. Thanks Gav.